When it comes to trying new foods, I have to admit that I can often be as hesitant and stubborn as my kids. How do I know if I'm going to like it? What if I take a big bite and find myself wanting to spit it right out? I mentioned I'm a bit like a kid, right? 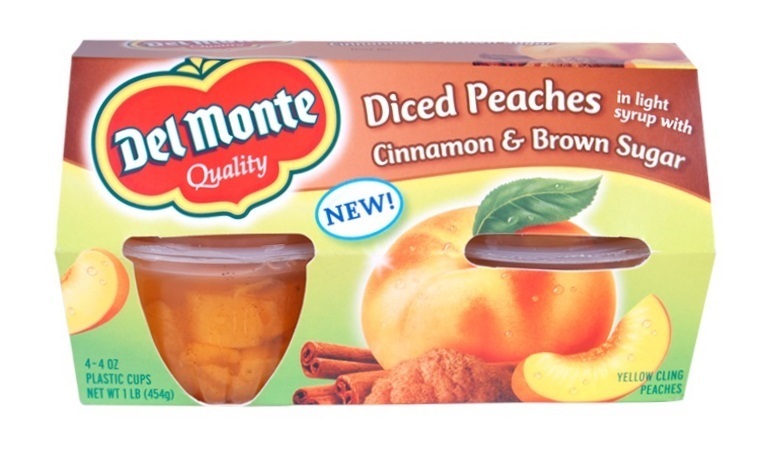 However, as soon as I read the title of Del Monte's newest fruit cup, I knew that there was no way that I could go wrong. Is it possible that Diced Peaches in light syrup with Cinnamon and Brown Sugar could be anything but delicious? I mean, really: I like peaches, I like cinnamon, I like brown sugar. This combination was making my mouth water right away and it wasn't long before I was grabbing my keys and heading out to my local Walmart to pick up a few packages. 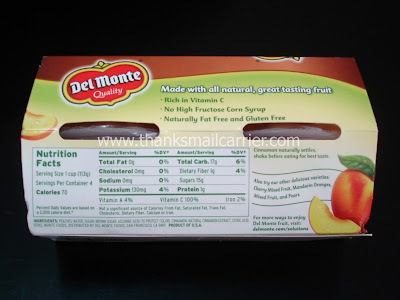 Click here or on the picture above to see my complete #DelMonte shopping trips (yes, plural) as I hunted down this new snack! Although it took visiting two Walmarts before finding these, it was worth it! 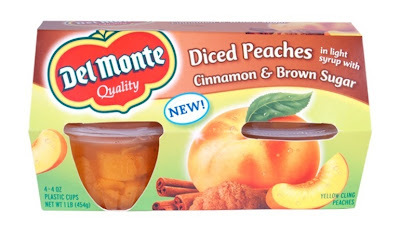 With my Del Monte Diced Peaches with Cinnamon and Brown Sugar finally in hand, it was time to take them home and try them during my next free moment. I knew that eventually I would share them with my girls, but for now, I was prepared to keep this tasty secret all to myself. 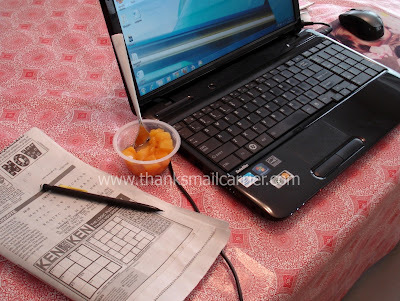 Life around here is a tad on the hectic side, so on the days that we're running between errands and school and friends and appointments, by the time I have a few moments of peace and quiet in the afternoon while my kids are napping/resting, that means it's Mommy Time. See that big ZERO for how many grams of fat there are in these? And only 70 calories for a whole cup full of yummy peach goodness! Let me tell you, Mommy Time just got so much better. I've tried these heated up, with yogurt, over ice cream, with crumbled graham crackers, with chocolate... oh, they're good. The amount of cinnamon and sugar included is just right and even if I'm eating them just straight out of the cup with a spoon, there's nothing better than kicking back and enjoying them all for me. Everyone needs a break with a snack and a puzzle, right? ...while there are also the especially nice times when I block out the world for a few minutes and really sit back and relax. The only problem with those? I'm often too relaxed and not paying enough attention to where I'm wielding my cup and spoon while I'm getting into watching something on DVR or chatting on the phone. Oops! 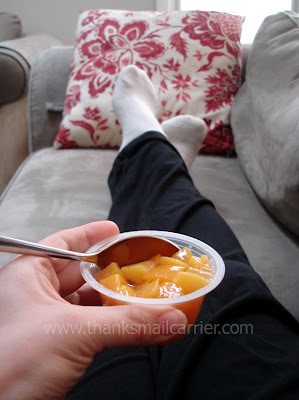 Fortunately, these peaches wipe easily off of my couch, so on top of being delicious and fat free, they're no-stress for me on multiple levels! Whenever I do finally get around to sharing them with my kids (more like if) then I won't have to cringe if Big Sister E knocks her cup over or Little Sister B misses her mouth for the 10th time. But until then, they're all for Mommy. 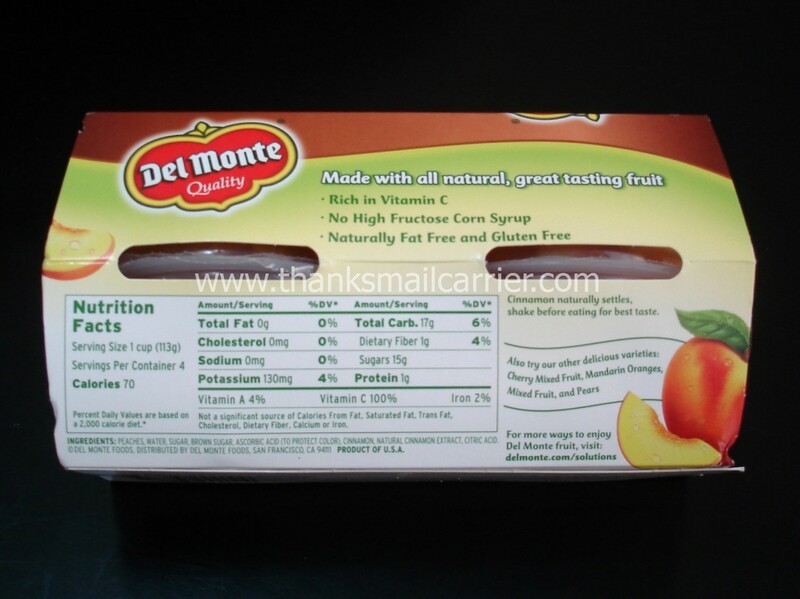 Next up, I'm checking out Del Monte on Twitter and Facebook and then going right to the long list of recipes on their website. Because as well as all of the ways that there are to eat the Diced Peaches in light syrup with Cinnamon and Brown Sugar on their own or added with a few other ingredients, I want to see what ways these could really be a part of a breakfast or dessert. Mmmm... stay tuned! Mmmm, I want to try these so bad! 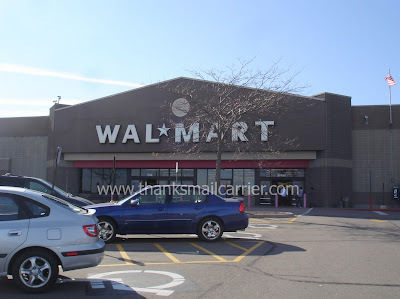 I will have to check out my local Walmart! Thanks for the heads up! I picked some up a few days ago and thought they were a great tasting snack!! Girl, you need a bib if you're gonna gobble up goodness like that. That would be SUCH a great lunchbox item if a mom would ever possibly want to share them. Love Liz's comment! 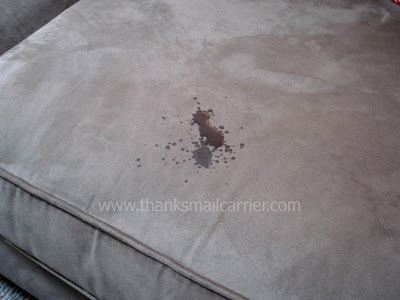 Glad they cleaned up easy, and truth be told I spilled some on my kitchen floor as well. But well worth the clean up for the yumminess! Wow, I've had canned peaches just sitting around. I didn't think to use brown sugar and cinnamon, although now that you posted about it, so obviously delish! Now I'm psyched to use those peaches! !